Mobile development has become a ubiquitous part of the software industry, and most developers understand the central dilemma organizations face when building a mobile app: cross-platform development. What options exist for deploying an app to multiple platforms simultaneously? What are the strengths and weaknesses of each platform? 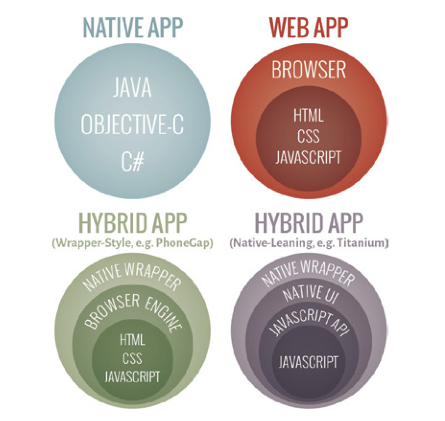 The backbone of mobile development is the native application, but there are a growing number of alternatives: web apps provide a browser-based solution, hybrid apps leverage web development skills in a native package, and code translators apply one platform’s native development skillset to the codebase of another. However, the differences can be subtle, and every option carries its own set of drawbacks. Native applications are built from the ground up for a specific platform and tailored to fit it. The precise, platform-centered nature of native development means that these apps have no limits in terms of access to APIs and device features, performance optimization, and platform-specific best practices for user interface design. Ideally, every mobile app would be built this way: to suit its exact purpose while utilizing all of the available resources. One of the major benefits of native mobile development is the availability of resources. For example, developers targeting Android have the Android Software Development Kit (SDK) at their disposal, which includes a suite of tools to streamline the development process: the SDK Manager condenses updates and tool installations into a single menu, the AVD Manager provides access to the Android Emulator and other virtual devices, and the Dalvik Debug Monitor Server (DDMS) is a powerful debugging tool, just to name a few. iOS and Windows Phone developers have similar toolsets available in their SDKs, covering everything from the UI and device feature tools of Cocoa Touch in the iOS SDK to the real world testing conditions of the Simulation Dashboard for Windows Phone 8. These toolsets make native SDKs invaluable and thorough resources. Unfortunately, the native SDKs are all robust toolsets that a native developer has to learn for each platform. To develop native apps from scratch (rather than through an intermediate tool), developers must be skilled with the required language, IDE, and development tools for each targeted platform, and if developers with diverse skillsets are not available, additional developers must be hired. This can be a serious problem, given the increasing push to develop on multiple platforms. 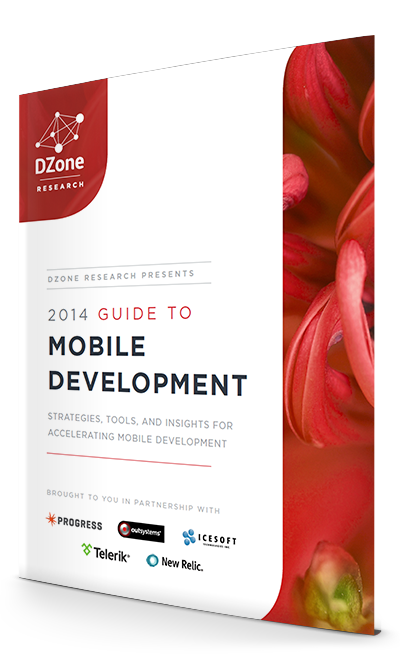 For example, according to DZone’s 2014 Mobile Developer Survey, 62% of respondents targeted both Android and iOS. The economic constraints of native development are a major factor in the growing popularity of web apps, hybrid apps, code translators, and Mobile Application Development Platforms (MADPs), which allow developers to reach multiple platforms with just one tooling ecosystem. The community around open source web technologies is another key difference between native and web development. Web technologies like Node.js and AngularJS are some of the most popular projects in the open source community according to GitHub statistics. This suggests that the community support and knowledge base around web technologies is broader than native technologies. In addition to being a more common skill set, mobile web development can also solve a fundamental issue with native application development. Aside from possible browser compatibility issues, web apps present a near-universal cross-platform option. Most APIs and hardware features will not be accessible by web apps, and because they are not discrete applications in the same way that native apps are, web apps cannot be distributed through common means, such as Apple’s App Store and Google’s Android Marketplace. Web apps may be a particularly flexible option, but they lack a presence on fundamental mobile distribution. Many of the drawbacks for web apps are alleviated by another cross-platform option built on the same core web development skillset: the hybrid app. Like web apps, hybrid apps require web development skills, but unlike web apps, they include some native features to allow greater flexibility. It gets the name hybrid because it is built with web languages and technologies at its core. With the help of a native packaging tool, it can be deployed just like a native app and access more native device capabilities (device APIs) than a pure web application. A less comprehensive but more straightforward solution is to use code translators when building native apps for multiple operating systems. These tools take native code and translate it into another platform’s native code, or translate native code into a neutral low-level alternative, such as bytecode. One example is Google’s J2ObjC, which translates Java classes into their Objective-C equivalents, alleviating a lot the initial development of an iOS version of the app. Although it’s much more than a code translator, a product called Xamarin does something similar by allowing developers working with C# and .NET in Visual Studio to produce a native ARM executable. They can then take advantage of ahead-of-time (AOT) or just-in-time (JIT) compilation to run their apps on iOS and Android in addition to Windows Phone. As is the case with hybrid apps, the UI presents a problem. Because UI development cannot be translated between platforms, code translators still require a significant knowledge of the native platform to write the UI. In other words, code translators can provide substantial benefits in terms of cutting down development time, but they’re not necessarily a “write once, run anywhere” solution. Between native apps, web apps, hybrid apps, and the growing number of MADPs, there are a lot of options for mobile development. It’s important to note that there is no one solution that does everything. Some sacrifice affordability and accessibility for pure native performance, UI for easy cross-platform deployment, or ease of development for native authenticity. Even the simplest tools come with some degree of a learning curve. If a method with no trade-offs existed, the industry would adopt it en masse, and you would know about it. Because there are trade-offs, developers and decision-makers will have to recognize their needs, and the needs of their users, in order to determine the best way to approach mobile development. Want to read more articles like this? Download the free guide today!